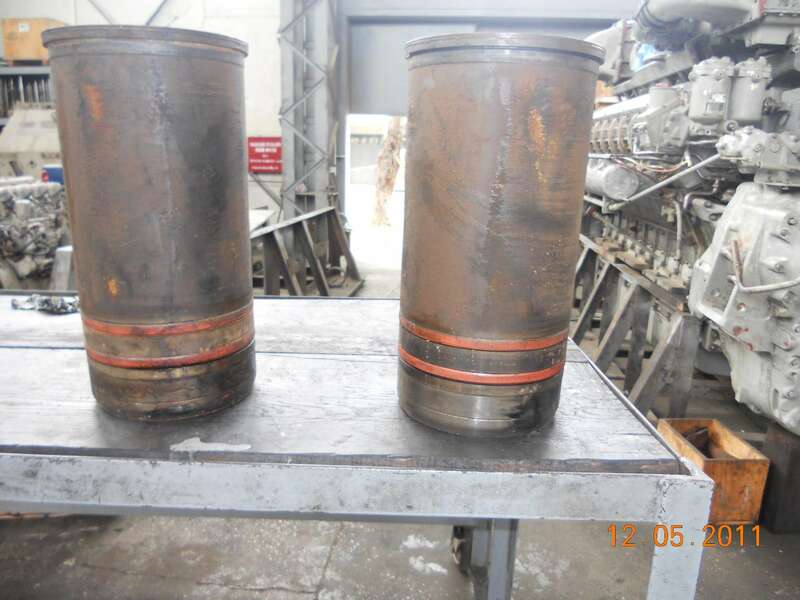 we have 2500 HP, fresh water cooled Diesel engine's cylinder piston liners. Picture of worn material is attached. I will give you information about the material conditions of work.2 - 3 kg/cm2 water cooling pressure is cyclating arround the liner, and it takes the outside temperature of the liner 90 C "during engine running". And the max temp. inside the liner is 900 C.
The material of the liner is cast iron. And the problem is pitting corrosion and abrasion(erresion) on the liner. As you can see the pictures. We are plannig to use HVOF for coating. Please help me, the choice of materials . Waiting for valuable comments. The picture seems to illustrate a curious pattern to the pitting. It appears as though this is only happening on one side of the liner(s). Is that accurate? 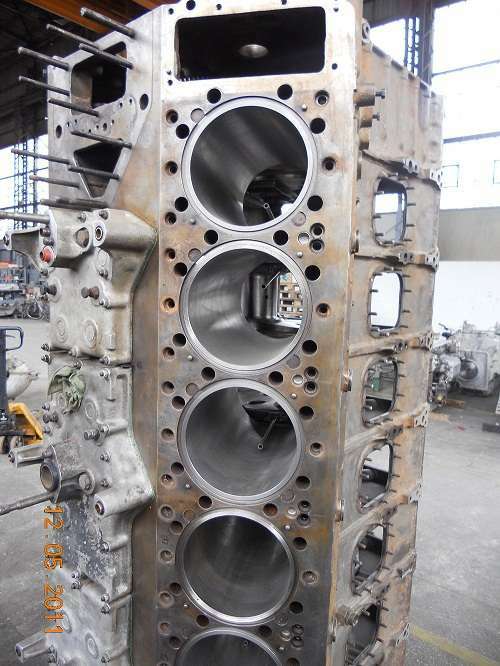 If it is only one side, as it appears, then I would suspect that either the piston is not running concentric to the bore in operation (therefore wearing one side more aggressively), or there was some flaw to the casting process that left greater porosity on one side (which would tend to show greater corrosion-erosion effects). The cracking may suggest that there is a temperature issue present. How does the crack occur? Is there a tendency for longitudinal cracks? Spiderweb? Circumferential? Is the 90C measured by water temps in operation? If it is, then there may be some sort of quench cracking in play, and this is a much more difficult problem to solve than the above. I suppose a root cause needs to be determined before deciding on the solution. In the absence of clear evidence it might be best to use some kind of a high carbon steel (try to maximize bond while matching thermal expansion to the base metal) with a high temp sealer and see what happens. (05-24-2011 04:50 PM)MichiganMan Wrote: The picture seems to illustrate a curious pattern to the pitting. It appears as though this is only happening on one side of the liner(s). Is that accurate? I think this type of pitting pattern is pretty common to liners. Like the original poster indicates, its the direciton of flow of coolant around the liners which causes the specific patterns. The real fix would be to change the original liner material. There are types that hold up much better than others. The good news is that I don't think it would be difficult to find a coating that would hold up better. Maybe alum bronze. Looking at your photos and thinking about this for a while, I think the problem is not one of normal abrasion/erosion but one of cavitation (erosion caused by formation and collapse of vapour bubbles) caused by shock wave/vibration from combustion/piston movement and no doubt compounded by pressurised flow of coolant, high temperature differentials and corrosion. 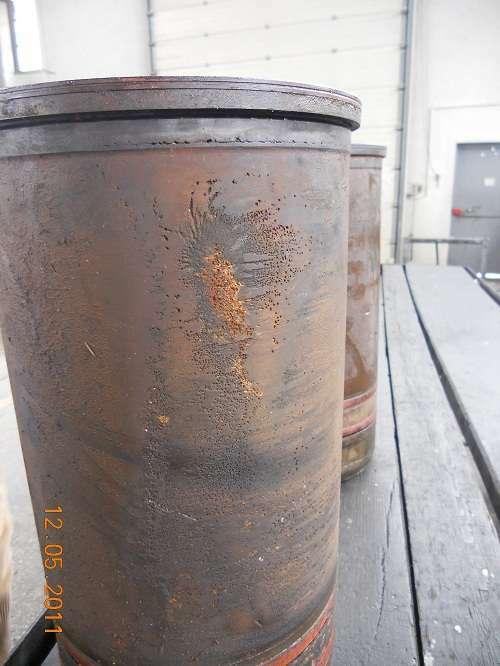 The normal coating recommendations for cavitation erosion are for materials that resist surface fatigue and corrosion. HVOF Inconel 625 I think is certainly worthy of consideration as with your thoughts on 316 austenitic stainless steel (good as its surface readily work hardens). NiCrBSi, Stellite 6, WC/CoCr, aluminium bronze and CuNi.